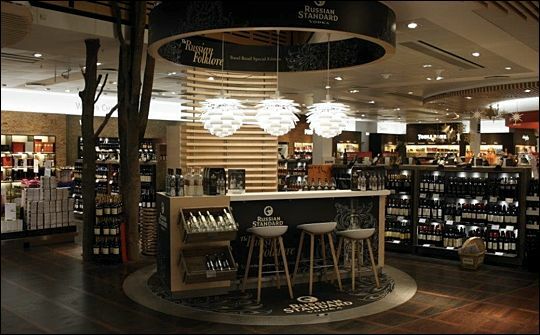 Copenhagen Airport is currently staging the first high profile promotion of a new travel retail exclusive – Russian Standard Vodka Original ‘Folklore’ edition. Timed to coincide with New Year celebrations, the month-long promotion of the limited edition by Russian Standard Vodka, distributed by Rémy Cointreau GTR and duty free retailer Gebr. Heinemann, will include a beautifully furnished tasting bar, themed display cabinets and a special gift with purchase offer. This first special edition sleeve for Russian Standard Original one litre celebrates the art of craftsmanship in Russia, depicting the magical ‘Zhar Ptitsa’ firebird, which is famous in Russian folklore and tradition. The rich heritage of the brand’s Russian provenance makes the Folklore edition a charming and evocative gift. Russian Standard is made exclusively in St. Petersburg, where the famed Russian scientist Dmitri Mendeleev, founder of the Periodic Table, established the principals of vodka-making in the 19th century. Chris Barber, head of branding, design and art direction at Russian Standard tells The Drinks Report: "Russia has an extraordinary history of beautiful arts, crafts and design, and we wanted to take the opportunity to celebrate our rich heritage. This first Special Edition has been inspired by the incredible artistry of the famous magical glowing bird illustration 'Zhar Ptitsa' famed in Russian folklore. Every single detail of the illustration was meticulously crafted to work in harmony with the brand’s iconic bell shape bottle. The final execution uses exquisite metallic print technology, which we believe brings the illustration alive. The result is something very classic - reinvented it in a totally innovative and luxury manner. We are very proud of the result!" Besides tempting travellers with this evocative Russian Standard Original Folklore edition, the sales assistants will advise customers that if they purchase two bottles of premium Russian Standard Gold or Platinum, they will receive a free cocktail shaker.